It seems like eons ago now, but it wasn't. It was less than two months ago the market looked and felt like it was falling off a cliff... beyond help. As of December 6th, the S&P 500 was off 8% from its September peak, en route to what would ultimately be a 20% drubbing from its high made by December 24th. It was a selloff that certainly inspired plenty of pessimism about the future. Cantor Fitzgerald's Peter Cecchini commented on December 10th "Our disposition towards equities has moved from buy-the-dip to sell-the-rally. If I'm not constructive on the credit markets, then I won't be constructive on the equity markets." (He wasn't constructive on credit markets.) On the 18th, Instinet's Frank Cappelleri noted "Quite simply, upside follow-through has been lacking, keeping negative momentum in the driver's seat. And if this doesn't change, the same scenario will persist." DoubleLine Capital CEO Jeffery Gundlach told investors on the 17th "This is definitely a bear market." A week later, a major bottom would be made. A month and a half after that, the S&P 500 would be up 16% from its late-December lows, re-gaining most of what was last from September's highs. Hopefully you weren't listening too closely, or taking all the naysaying to heart. It's a scenario that begs a question though (actually it begs several questions, though we'll focus on one): How can so many smart people be so wrong about what's to come? There's an understandable - even reasonable - defense. That is, not even the professionals and the pundits are immune to the impact that fear can have on the decision-making process. It was a point in time when things looked grim, and felt grim. It would have been difficult for anyone to not toe the line when surrounded by a crowd that was absolutely certain things could only get worse. That doesn't change the fact, however, that a whole lot of people that should have known better didn't know better. Take a really close look at the data posted at the time. With the exception of real estate, the economic numbers were good. November's jobs data (posted in early December) wasn't as good as October's, suggesting a hiring slowdown and wage-growth slowdown was in the offing. Context is everything though. We're already at or near maximum employment. Wage growth had grown steadily leading up to that month. All big trends start out as small ones, but investors were fearing a trend that hadn't actually given us good reason to worry. Despite new tariffs, earnings were up firmly in Q3. Fear, and nothing but fear, did the deed. It can happen, when the mountain of fear is intimidating enough. But bailing out by mid-December was still ultimately the wrong call. The time to sell was in September. The time to buy was in mid-December, when paranoia was at its peak. The follow-up question: How does one know when fear is at its most frenzied, unsustainable levels? We keep close tabs on two such tools, though more are out there for those who care to look for them. Our two, however, are enough. The first of them is the VIX, or CBOE Volatility Index... one of the details included on all the charts presented in the Weekly Market Outlook. This so-called 'fear gauge' essentially measures how scared or elated traders are at any given time. Interestingly, though not surprisingly to students of the market, we see fear surging at major market bottoms. We also see fear at uncomfortably low levels when stocks are at or near a peak. The VIX's move to multi-month highs in December should have been a warning that traders were unreasonably worried. The other tool we like to use as a measure of fear - or greed - is the put/call ratio. Using the number of bearish puts traded on equities on any given day versus the number of bullish calls traded that same day, we can actually get a good feel for how much hedging the market is doing. 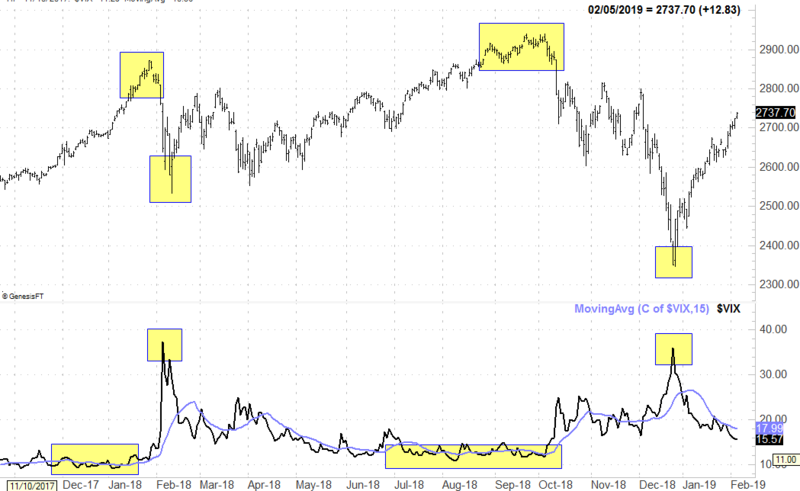 When this ratio moves to close to the 1.0 area, fear has usually peaked and a bottom has been made... anybody who wanted out of the market is already out. When it's at unusually low levels, a rally has usually run its course. So why don't more traders, professional and amateur alike, keep an eye on one or both of these indicators? Two reasons. This, by the way, is the valuable "take-away" of this commentary... perhaps the best trading advice you'll ever get in your life. 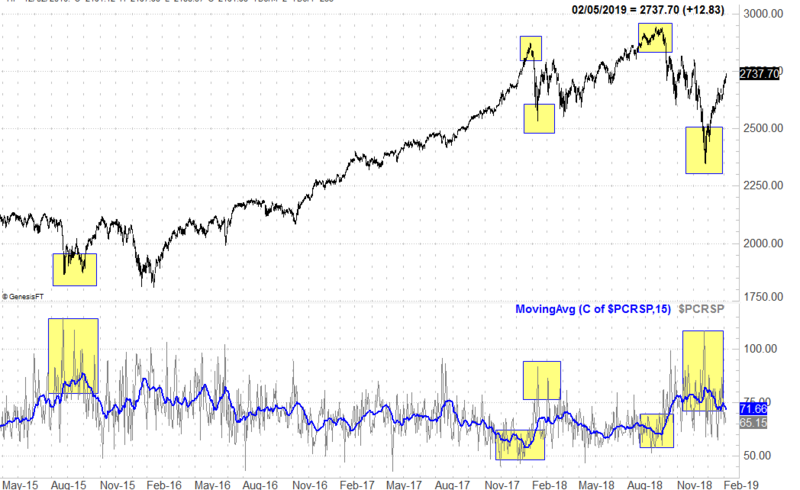 The first reason most people from all corners of the market don't pay attention to what the VIX and put/call ratio is telling them is, they don't want to believe it. It's a rationalization issue, first and foremost. It makes little superficial sense that the crowd is most wrong when it's sure it's the most right. Traders are trained to believe there's an obvious logic to the way the market moves, and in some regards there is. More often than not though, traders as a group are thinking irrationally, spurred into action by fear and greed. Fear and greed can alter sound decision-making protocols. Said in simpler terms, despite the history of evidence that confirms nothing lasts forever, there's an ever-present "this time is different" mindset that most individuals just can't shake. Fear and greed can do that. The other reason tools like the put/call ratio and the VIX go unused? They're difficult, if not impossible, to quantify in a way that creates a buy/sell algorithm. And, for the record, while both indicators are powerful, they're not ideally suited to be looked at in a vacuum. They're best used as part of a bigger-picture report that helps you spot the market's major turning points. The good news and bad news is, most people reading this still won't be able to believe in the idea, or alter their mindset. And, of those that do, the first failure will quickly convince them that the tools are fallible. There's no disagreement that put/call ratio and the VIX aren't infallible. They're right more often than not, however, for traders that understand their power as an odds-making tool. Unless you can resist the trappings of fear and greed though, you'll never actually see how helpful these indicators are. 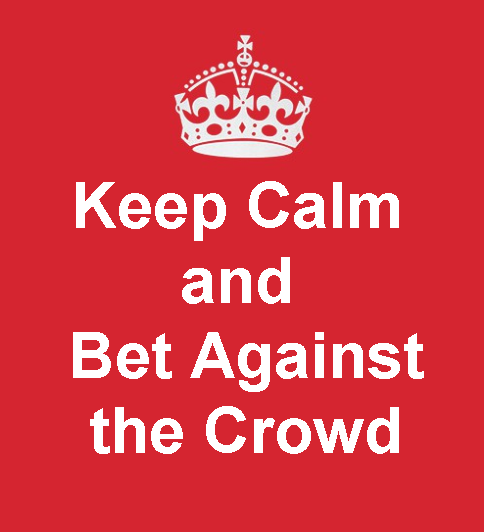 Keep calm and bet against the crowd, especially when the crowd is a screaming horde.